As it turns out, a cask is occasionally ‘shared’ between different bottlers. For example, Helen Arthur and Jack Wieber could buy a cask together and bottle part of the cask as a ‘Helen Arthur Special Collection’ bottling and part as a ‘Jack Wieber’s Old Premier Cross Prenzlow Castle Hill Train Line Special Cask’ bottling. Hmmm… This practice worries me. There is already a growing gap between the traditional ‘image’ of the whisky world (especially single malts) that is propagated in the media and today’s more business-like reality. Because most of the popular official bottlings are produced as massive vattings of dozens and sometimes even hundreds of different casks, ‘batch variation’ between different bottlings of the ‘same’ whisky does occur. That’s why single cask bottlings are especially loved by most malt maniacs. When one of us finds a great whisky from a particular cask, we can share the news with other maniacs and they would have a chance to experience the very same whisky. However, now it turns out that even bottlings from the same cask can be different; sometimes VERY different indeed. Sometimes the whisky in a cask isn’t bottled all at once, but in various stages. Needless to say, the whisky that stays longer in the cask will pick up more wood influence (for better or for worse). 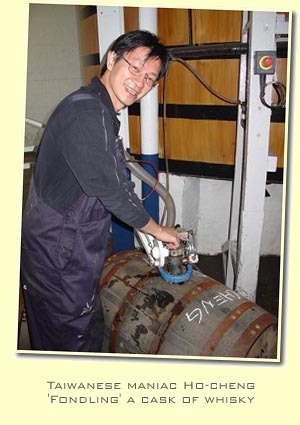 The amount of air in the cask will grow as well, changing the interaction between wood and whisky. I imagine this wouldn’t be much of a problem if the difference between two bottlings was a matter of days – but what if it’s months or years? In that case there can be very DIFFERENT bottlings from the SAME cask. Or, imagine the contents of ex-bourbon cask #10358 and ex-sherry cask #10359 being ‘vatted’ and finished in ex-port cask #4711? Does that make it a single cask bottling? I admit these may seem like really ‘anoraky’ issues, but one of the things that drew me to single malts was the ‘authenticity’ of the product. The whisky industry as a whole loves to accentuate that aspect of (single malt) whisky, but on the ‘trade’ end of the business some consider the practical implications of that authenticity as a complicating factor… They don’t like the consumers to be TOO close to the product (= knowing TOO much about the product) because that only inspires them to ask difficult questions and look for specific bottles that other consumers liked instead of simply picking up what the liquorist suggests. So there you have it – at least a clear answer. So, the ‘number’ on Douglas Laing bottlings refers to a bottling, not a cask. For ‘tracking & tracing’ purposes the original cask number would be even better I guess, but at least in this case we’ll know that every bottle from a series with a certain ‘DL Reference’ number should be the same. That’s still better than a situation where people could buy a particular bottling based on the cask number, only to find that the glowing reports they’ve read were for an OTHER bottling from the SAME cask. Ah well, maybe I’m just being stubborn, but until we’ve figured out what’s the deal here I’ve marked all bottles on the monitor where something ‘unusual’ might have happened to the cask before (all of it) was bottled. Those cases are marked as ‘FONDLED CASK?’.